1 drawing on paper ; image 6 x 7.875 in., on sheet 8 x 10.5 in. 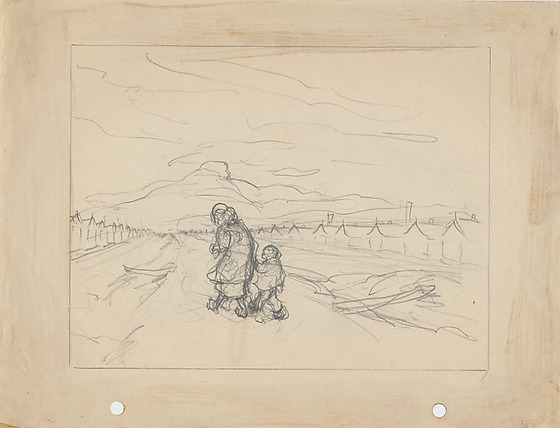 Pencil sketch of a woman and child walking on road between barracks at Heart Mountain concentration camp. 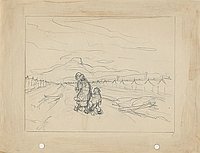 In foreground a woman holds the hand of a child as they walk away from the viewer up a road lined by barracks. Road extends into the distance where Heart Mountain rises in background. Clouds indicated by lines. Rectangular line border. Two holes punched along bottom.